Write each problem a customer mentioned on a separate sticky. 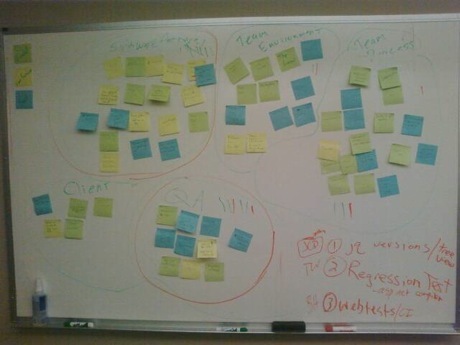 If you interviewed ten customers and each identified five problems, you should have fifty stickies. Using stickies allows you to visualize your data quickly and determine pattens such as problem importance, which would be based on the number of stickies in each cluster. All the problems you see on the wall will represent your customer’s “top-of-mind” problems, which are problems that your customer knows about and is thinking about. Side note: Eventually, you’ll need to start identifying the other important problems: the “not-in-my-mind-but-is-a-major-problem-that-I-didn’t-know-about” problems. You can do this in two ways: interviewing customers and being very inquisitive about every detail, and studying their behavior. Now that we have a list of the most common problems/themes, we need to understand how important they are to our customers. But wait, shouldn’t the size of the cluster tell us this? Not necessarily! As I mentioned before, customers usually will tell you their “top-of-mind” problems, but not all their problems. When you back to your customers, get them to prioritize these themes to help you understand the importance of each theme, how they rank against each other, and why each one is important or not important to them. The more customers you can do this with, the better; you’ll get to start understanding their perspective and gather valuable insights. Use card sorting or something similar for this exercise. Which 3-5 themes are consistently ranked as the most important ones? These are the themes you want your solution to nail to a certain degree. Were there any themes that your customers didn’t previously think about but now are aware of how important they are from this exercise? These are themes that if you solve could make for great marketing material as they’ll show you know their industry/domain very well. What themes can you throw out or defer to later? These are the themes that you can work on incorporating later once your initial product has found success. With a solid understanding of your customers, their problems, and their needs, we can finally start investigating what value prop we can deliver and the corresponding solution.